Take a look at this beautiful new deck and open porch in Johnson County KS. You’ll never believe what this deck looked like before the rebuild. Scroll down to see the before & after. 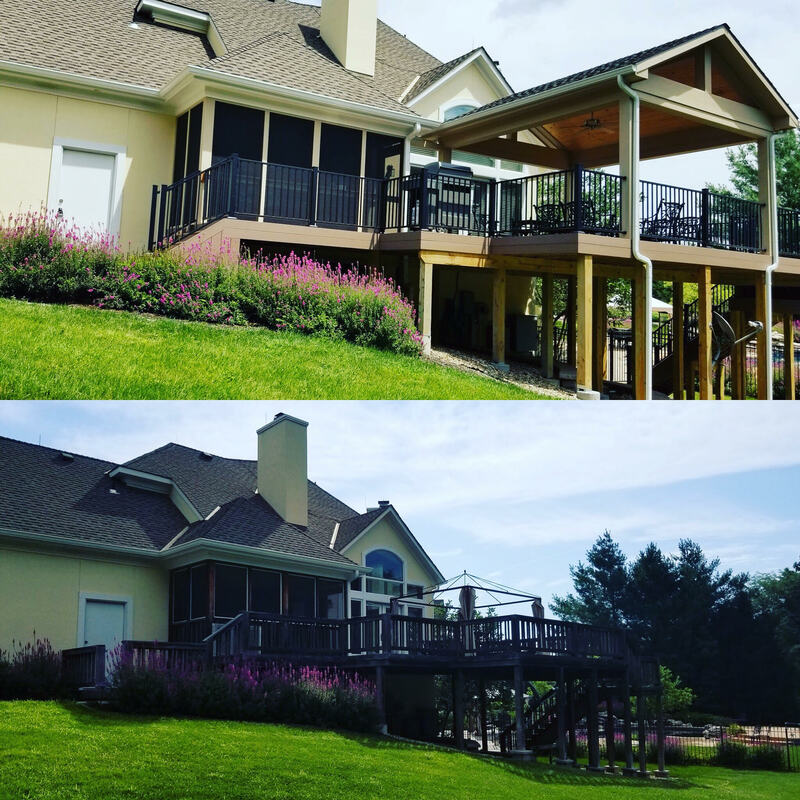 If you’re having a hard time imagining how your old deck would look if it was rebuilt, see the dramatic transformation in the before and after photo below. If your deck is old, tired, and requires annual maintenance, you may want to consider a new deck utilizing updated low-maintenance materials. 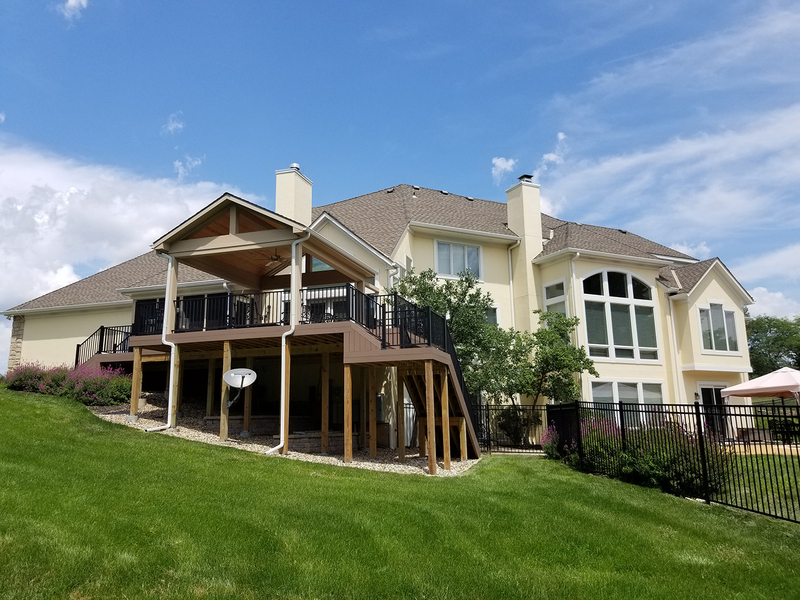 These homeowners in Johnson County KS selected low-maintenance synthetic AZEK decking for the deck. The narrow-profile black aluminum railing pickets ensure maximum visibility from the deck to the yard beyond. 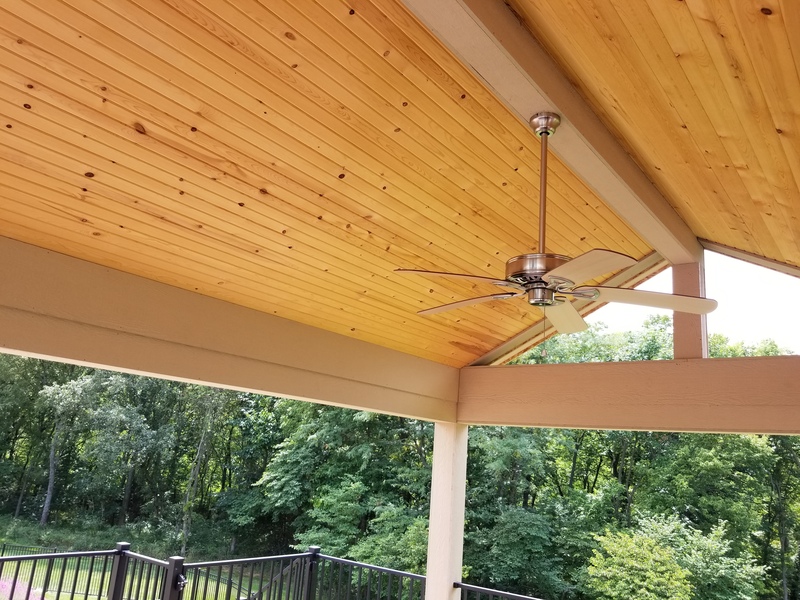 In addition to replacing the deck, these homeowners also decided to add an open porch to cover a portion of the deck, leaving other areas of the deck open to full sun exposure. The ceiling of the covered porch is tongue & groove pine. The porch has an open gable end to allow maximum light into the space while still providing the sun protection they desire. Notice the way the column trim matches the home’s color. At Archadeck of Kansas City, we work to ensure your new space looks original to your home. 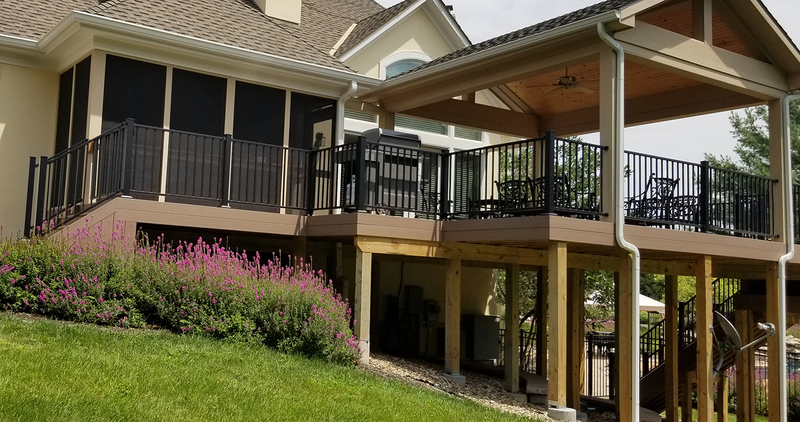 This synthetic deck and porch combination project has a couple additional features you might not notice at first glance. There are 2 sets of stairs. When designing outdoor living spaces, we help you consider traffic patterns and access from your new space to other areas of your home or your yard. The deck has an uncovered section for the grill. That section of the deck is tucked back continuing to ensure great traffic flow through the space. While the yard has a significant grade drop, we were able to elevate the deck to make sure the deck and porch could be accessed from the living story of the house. If you are considering adding a new deck or open porch to your Kansas City area home, give us a call for a free consultation at (913) 851-3325 or drop us an email. We look forward to working with you to design the perfect new outdoor living space for your home.